The restaurant at Hotell Forsen is a popular place for everyone who likes to socialise and eat well-cooked food made from local produce sourced from the forests, lakes, fields, farms, mountains and seas in our vicinity. Saturdays and Sundays, the kitchen is closed unless group bookings are made. Lunch of the day is served weekdays from 11:00–13:30 Lunch includes a warm meal, salad buffet, bread, drink and coffee. Please contact us to book a table if you travel in larger groups. We always have a vegetarian lunch option on offer. Come experience the tranquillity by the river! Our hotel dinner is served on weekdays from 17:00–20:00. Please call to check the menu as our chefs continually create new dishes depending on season and produce available. Our chefs use local produce creatively when composing the menus based upon season. We often collaborate with small-scale suppliers to guarantee high-quality and unique products. Our assortment of wine and beer is well thought out and is regularly updated to suit the menu. Our wine list also includes at least one organic wine and we always aim to offer wine and beer from small-scale vineyards and breweries. 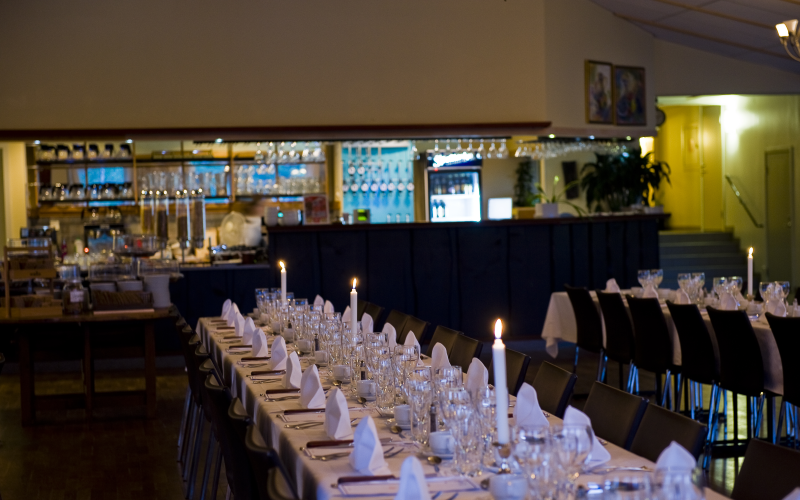 As a matter of fact, Västerbotten has several microbreweries, so naturally, we serve their products in our restaurant. Anna Öbrand is in charge of beverages and the bar at the hotel, if you have any questions. Please book a table at our a la carte restaurant at least two days in advance so we can guarantee fresh ingredients. Come enjoy a pleasant meal with friends and family!